BAGLEY, MARK - Amazing Spider-Man #383 pg 11, incredible full page splash panel of Spidey! Spider-Man and Mary Jane in every panel! 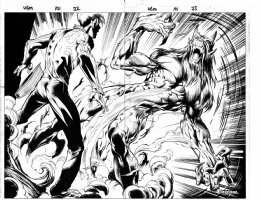 BAGLEY, MARK - Amazing Spider-Man #391 pg 20, Spidey battles Shriek…CHAKOOOOM! BAGLEY, MARK - Amazing Spider-Man #400 pg 46, 400th issue Mary-Jane MJ sees Peter Parker arrested! 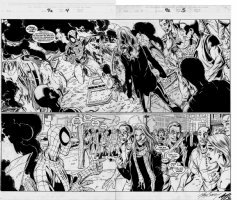 BAGLEY, MARK - Ultimate Spider-Man #42 pgs 4-5, Spider-Man vs a hostile, and sarcastic, crowd! BAGLEY, MARK - Ultimate Spider-Man #51 pencil cover art, Wow, Spidey is stunned just looking at the beautiful Black Cat! BAGLEY, MARK - Ultimate Spider-Man #56 pencil cover art, Spider-Man is wary of an attack from Doctor Octopus! 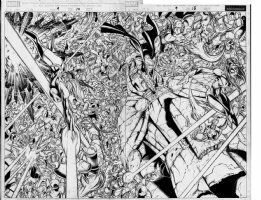 BAGLEY, MARK - Ultimate Spider-Man #87 final cover art, Silver Sable with knife to Spidey! Guess they're breaking up?